One of the shortest film premieres at an Edinburgh cinema heralded the launch of what a gin distiller hopes will be a Christmas blockbuster. Pickering’s Gin founders Matthew Gammell and Marcus Pickering ‘star’ in the one minute and 20 seconds clip made by Altarmotive Films to promote the firm’s gin-filled bauble decorations. Daily Business attended a preview at the Dominion Cinema in Morningside which has just opened a gin lounge. The firm produced a small batch for a Christmas fair in 2014 and after seeing how popular they were it produced 30,000 last year, selling out online in 82 seconds. Production this year has been raised to one million which should transform last year’s £1 million turnover to well above £4m. The company, based at the former vet school at Summerhall, has also increased staff to cope with the additional output. 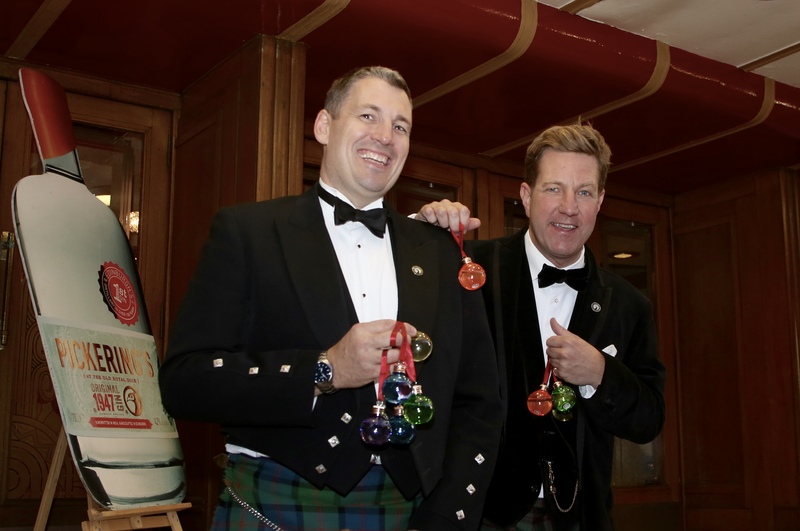 A ‘bauble war’ broke out recently when a rival London firm, Sipsmith, produced its own bauble, prompting Pickering’s to point out that the first range came out of the Summerhall distillery. Pickering’s has now patented the casing to stop imitators.